Coastal Living Ecuador (CLE) is a real estate development company based on the Ecuador coast. 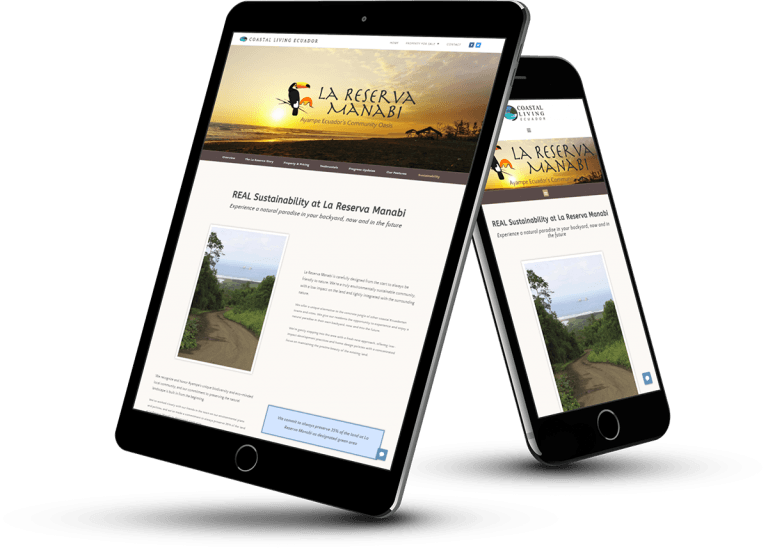 When they approached us they were launching the gorgeous beachfront eco-community La Reserva Manabi in Ayampe, Ecuador and were expanding to develop and sell more properties along the Pacific. 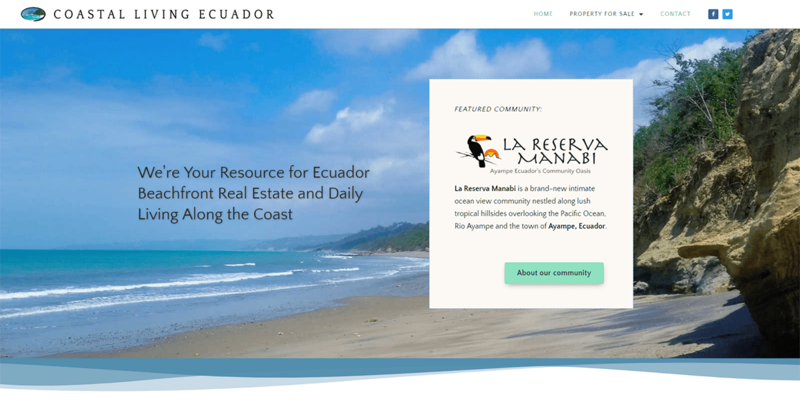 CLE had two existing sites on two domains: coastallivingecuador.com – for promoting the Ecuador coastal lifestyle, and lareservamanabi.com – for promoting the community and attracting buyers. Publishing two websites was doubling costs, and writing content for both sites doubled work and cut the ranking power of their content in half with duplicate content, risking a Google penalty. Both sites were built on stock WordPress themes. The visual styles were generic and unremarkable. Most importantly, the messaging and purpose of both sites was not clear, complete and compelling. They didn’t have a brand for the company or the community. So they weren’t attracting the kind of qualified traffic they needed or converting site visitors into leads or buyers. NOTE: Clients can alter websites after site launch . Site screenshots here show the website as originally designed. 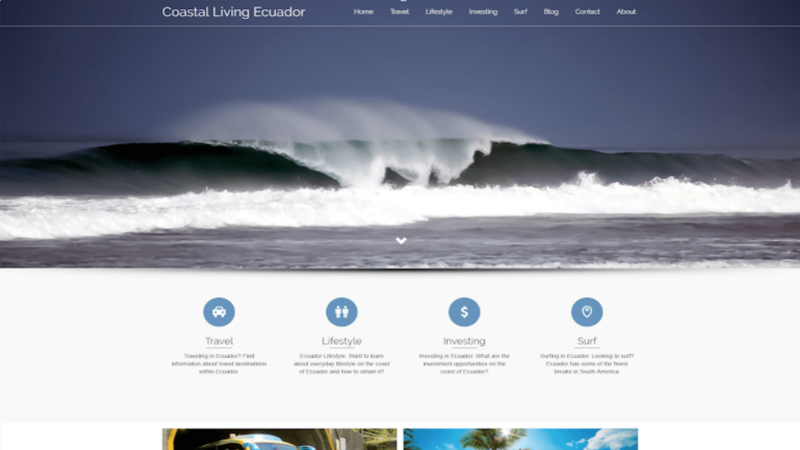 We recommended a brand new full custom WordPress package, combining both sites into one company branded website on coastallivingecuador.com. This simplified their marketing and could double their Google ranking power over time… a much more cost effective and powerful approach. This meant merging both sites into one with two related – yet distinct – brands. Now the community pages are inside the company site. The structure of the new site allows adding new community and property pages over time. We researched a thorough Voice of Customer Research (VoC) report for CLE. Their ideal customers are having in depth conversations about buying property on the coast of Ecuador in online forums. Many of the best strategic decisions and actual content for the site came from that report. Josh helped us put our knowledge into words for our potential clients. He understands what our prospects need to know from their viewpoint. Now people have all their questions about living abroad answered in 2 clicks! The new content not only helps our rankings, but also paints a vivid picture of living in Ecuador and of our project to perfection! We did a full exploration of their business needs and goals, and a complete Data Discovery to ensure the new site has all necessary pages and information. We created a UX Site Map to display all pages and the structure for the new merged site. 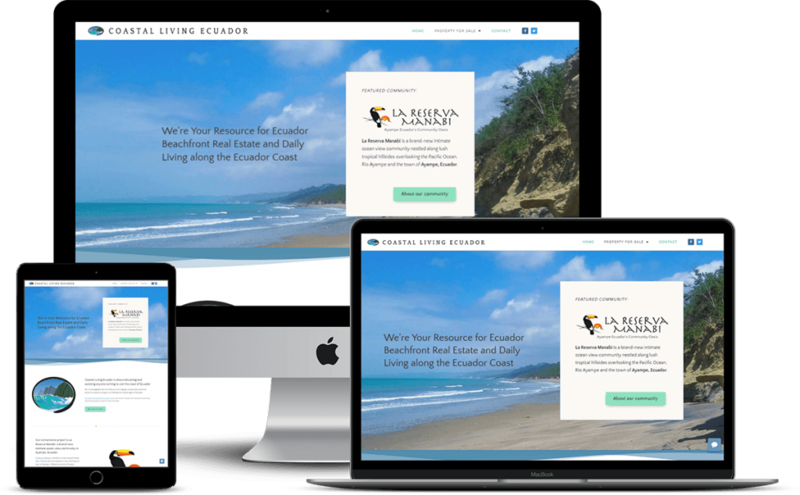 We thoroughly reviewed the websites of their closest competitors developing and selling property along their stretch of the coast, and did keyword research to plan a new site structure for easy Google scanning and indexing. We used the keyword research and Site Map to design an ‘SEO Silo’ structure for the site. We targeted the keyword ‘ecuador beachfront real estate’ as the main keyword with other relevant keywords in a theme. This builds Google ranking power into the site. We dove deep into their company identity, vision, and values in video meetings. We explored their customers problems, desires, dreams and goals. This is how we found the the best brand messages for the site and marketing. We used content from the Voice of Customer Research, Brand Strategy, and Content Questions documents - using with best practice web copywriting principles - to write carefully strategized copy for each new site page. Using the brand messages and other text content from earlier stages, we sequenced the messages for each page to tell their story clearly, to be easy to read, and guide the visitor down the page to contact CLE - get on a newsletter list - or start a chat. They had existing logo candidates for both sites. We discussed how the logos could fit with the new brand strategies. We used the final logo designs as guides to choosing fonts, colors, and other visual themes that matched each brand. We used the Elementor Page Builder and GeneratePress theme to custom build the new site to match our strategy, brand and content plans. The challenge was building two navigation systems that would work without causing confusion. We educate, coach, and answer client questions through our entire business relationship. Combining two sites into one is not a typical project. We take care to make sure our clients understand what's happening with their site and online marketing strategy. They began receiving compliments on the beautiful new website and interested prospects began contacting them within the first month. Using strategy we developed from a thorough Keyword & Competitor Research – we targeted keywords that their best prospects are using in their market to find properties like theirs. 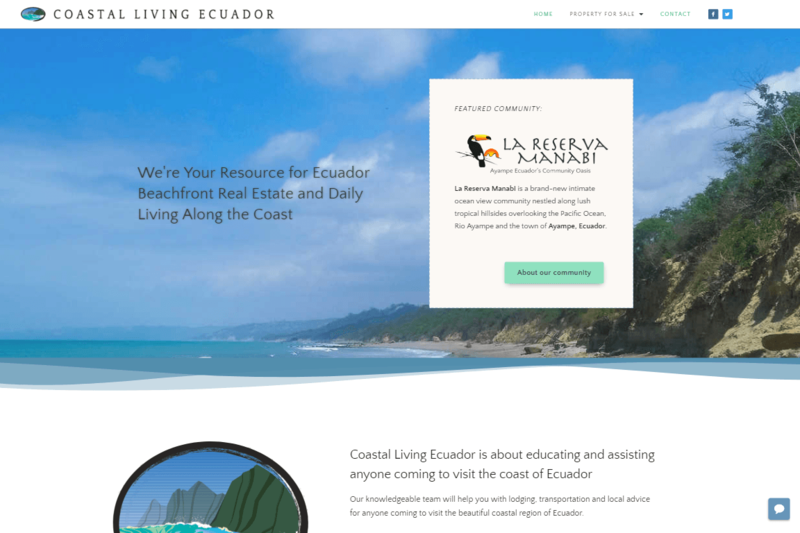 The Coastal Living Ecuador site recently hit Google Page #1 for one of their most important keywords and is quickly rising up the ranks for other targeted keywords every month. Coastal Living Ecuador has kept us on the team with an ongoing Care Plan retainer agreement. They’ve also hired us to expand the website with additional sections and pages as they add new properties to sell. 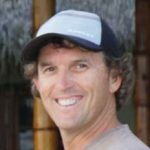 "Josh is very easy to follow with his step by step formula of building and creating a complete brand from logo to website. His knowledge of branding and getting your website to stand out is bar none. His formula is proven and he fills in the blanks with your information. I found it very easy to work with him and look forward to having him our team whenever the need arises!" Ready to get your business online & working right with a brand new WordPress website?